A place had to be found for our meetings and WBro Ted Archer, then Mr Archer, licensee of the Elms Public House was approached to see if the pub could accommodate us. He approached the brewery who gave their approval. Ted became our second initiate on the same night as our first WBro Ray Green. For many years it was common practice to conduct double initiation and passing ceremonies and hold emergency meetings because of the large number of men wanting to join Freemasonry and our Lodge in particular. The next step was to find furniture for our temple and diligent searching provided us with second hand furniture with the exception of the carpet. The brand new carpet later became our contribution to our present home at the Masonic Hall, Aldridge. Various wooden items of furniture were made by Phipps Packaging Ltd who had a woodmill and joiners. The company was laughingly known as Phipps Masonic Furniture Ltd.
Everything to hand the lodge was consecrated on 14th October 1963 which happened to be WBro AK Spencers 58th birthday. A full provincial team turned up headed by WBro Robert Bradley Mummery the then Provincial Grand Master of Staffordshire. The ritual worked was still more in line with Warwickshire tradition due to eighteen of the founders coming from there. Our little differences are derived from Lodge of Loyal Service where five of our founders plus two of our first joining members, namely WBro RM Spencer and WBro WH Noble, came from. Unfortunately neither had been in masonry long enough to qualify as founders. 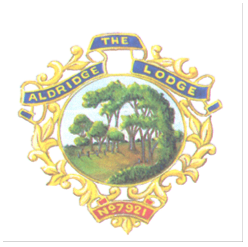 The lodge needed a banner and a meeting of the founders was called to consider a design. Research showed that in ancient times Aldridge was a clearing in a wood. We decided to depict this as the centre piece of the banner. Funds had to be raised for the purchase and several events were organised. The Directors of Phipps Packaging decided to put on a small show at the Elms Public House performed by the members. AK, JS and RM Spencer along with Tom Williams decided to mime to the Beatles record " She loves you ". They obtained wigs , guitars , the correct type of clothing and they called themselves " Dry rot and the Woodworms ". It was a great success and John’s solo as Gerry Marsden is Lodge legend. This was followed by a horse racing evening and a cheese and wine party at the home of WBro Doug Edwards which raised the £200 required. The founders who subsequently went into the chair all presented something to the lodge for our use. WBro T Williams presented our bible, WBro S Daniel the gavels used at our festive boards and WBro JS Spencer a lectern to name but a few.